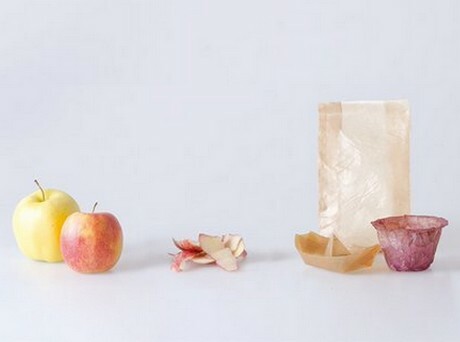 In a bid to provide a sustainable alternative to plastic, Italian designer Emma Sicher has combined food waste with bacteria and yeasts to create disposable packaging. To create the material fruit and vegetable scraps are soaked in water with scoby, acetic compound and some sugar. The microorganisms turn the fructose and vitamins in the scraps into pure cellulose, until it forms a gelatin-like material. This mixture is then left to rest for two to four weeks, depending on the desired thickness, before being heated and dried. Once dried, it becomes a translucent sheet of material, sharing similar characteristics to paper, plastic and leather. Dezeen.com explains how using different fruits creates sustainable packaging in a variety of colours. The material can be dried on different surfaces to achieve various textures and patterns. Sicher also experimented with different fruits and vegetables like apples, potatoes, beetroot, grape pomace and beer hops to create different colours and textures of the material.